These light blue Prostate Cancer Silicone Bracelets are embossed with the words "Hope, Faith, Love" and ribbons. These bracelets are made of high quality silicone that you can see and feel. These bracelets are 8 1/4 inches. This is a wholesale pack that contains 50 bracelets in a bag. 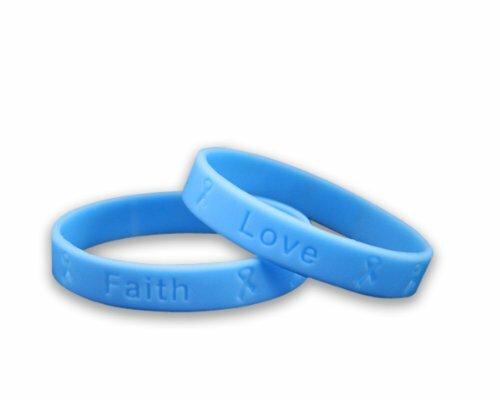 Prostate Cancer Awareness Adult Silicone Bracelets - Light Blue Elastic Band Reads "Hope, Faith, Love"
If you have any questions about this product by Fundraising For A Cause, contact us by completing and submitting the form below. If you are looking for a specif part number, please include it with your message.